Colleen founded Ardea in 2010 (back then CLT-Envirolaw) with the vision to harness her niche legal expertise in order to help companies understand how to meet their legal obligations for sustainability and business and human rights and create progressive voluntary best practice standards. Tackling modern slavery in supply chains and communities is a key passion of hers. Colleen is a tri-qualified solicitor with over 25 years’ legal and commercial experience of working with businesses and NGOs across sectors at both a strategic and operational level. She provides training to both directors and employees on human rights, modern slavery and sustainability issues. Colleen has a LLM (with distinction) in Environmental Law from the University of Aberdeen. She is recognised by The Legal 500 and Chambers and Partners as a leading environmental law practitioner. Colleen’s indefatigable passion for combating human trafficking, led her to found the not-for-profit organisation Finance Against Trafficking. Colleen lectures on business and human rights and environmental issues at Birkbeck School of Law. Recently she taught on an MBA programme at the University of Pisa on responsible business practices and modern slavery transparency in supply chains. She has spoken widely on the UN Guiding Principles on Business and Human Rights, modern slavery and sustainable business. She is a member of the steering group of the British Association for Sustainable Sport (BASIS) and was an executive member and trustee of the UK Environmental Law Association for seven years. She sits on the advisory board for LexisPSL Environment and has recently been appointed by Positive Luxury to their Advisory Council. She is also an Acre accredited expert. Colleen is a regular contributor to the legal and professional press and authored numerous chapters in published books. Her most recent book ‘Strategic Sustainable Procurement: law and best practice‘ is published by Routledge. Colleen was part of the Modern Slavery Garden team which won Gold at the Chelsea Flower Show 2016 and has been nominated for an award by the Anti Slavery Awards group. She has set up an anti trafficking hub at the Towers Convent school in West Sussex. 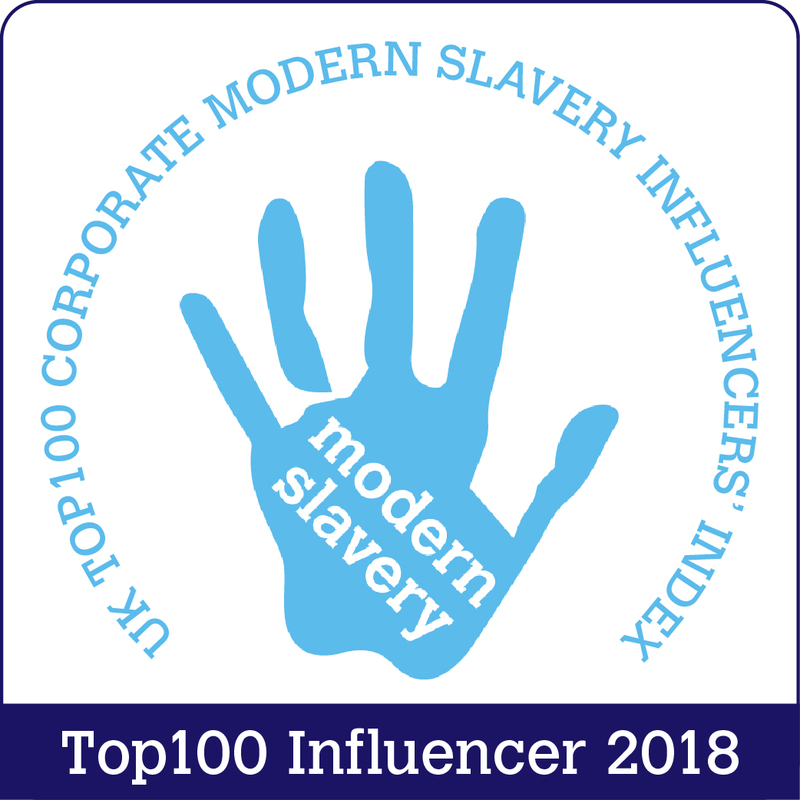 Recently nominated as on of the UK’s top 100 Influencer of business on modern slavery and ethical business issues. Laura is a qualified US lawyer and previously was a director at Talking Oak International, a specialist legal consultancy providing human rights advice, compliance support and training design and delivery to private security companies and other companies and NGOs operating in challenging and complex environments. She assisted the Security in Complex Environments Group (SCEG)—the trade association for the UK’s private security industry—with numerous projects preparatory work with the British Standards Institute to develop ISO 28007—2015; and the transition of the international standard for land based Private Security Companies (PSC 1) to a full International Standard (ISO 18788—2015). Laura retired from the US Army’s Judge Advocate General’s Corps after 23 years of active duty service. Her last military posting was in the UK Ministry of Defence as a member of the strategy team for the British Army Chief of the General Staff. Prior to this, she served in the British Army’s Operational Law Branch. Prior to her secondment with the British Army, Laura was the Chief of Operational Law in the US Army’s International and Operational Law Department, US Army Pentagon, where she also served as Rule of Law coordinator for the Army’s Stability Operations division. Laura’s deployed operational assignments with the US Army include tours in the Republic of South Korea, Somalia, Afghanistan, and Iraq serving in various legal and leadership roles. Laura earned her J.D. at Louisiana State University Law School (civil and common law), her LLM in Military law (International and Operational law specialty) from The Judge Advocate General’s School in Charlottesville, Virginia, and her BA from Brown University. Among her publications is, “Fog of Law: an introduction to the legal erosion of British fighting power” a report she co-authored for the Policy Exchange, a London based think tank. She also contributed to the US Army’s Rule of Law Handbook, Operational Law Handbook, and Interagency (U.S. Government) Complex Contingency Operations Legal Handbook. Isobel graduated in 2018 with a MA Understanding & Securing Human Rights (Distinction) from the University of London. A passionate anti-slavery advocate, Isobel’s thesis focused on the role of private sector collaboration in tackling modern slavery. She is particularly interested in approaches to integrate human rights into businesses’ broader sustainability agendas and facilitate engagement between NGOs and the private sector. Isobel has worked and volunteered for a number of organisations on improving access to labour rights and combatting human trafficking including UK-based Shiva Foundation, the Business & Human Rights Resource Centre and Environmental Resources Management (ERM). Having worked in diverse organisations, she has a broad perspective on the challenges of working with businesses on human rights and social change. Isobel also holds a BA (Hons) English Literature from the University of Exeter, UK. Emily is currently studying a degree in History and English at the University of York and has just completed her first year. She has previously worked as a blogger for a start-up company called Skadoosh centred on fashion and retail. She currently also works part- time at a nursery. After finishing her degree she intends to complete the GDL and hopes to work in the fields of human rights and environmental law, as this is the area she is most passionate about.